Did you play Skyrim? Good! Read on. 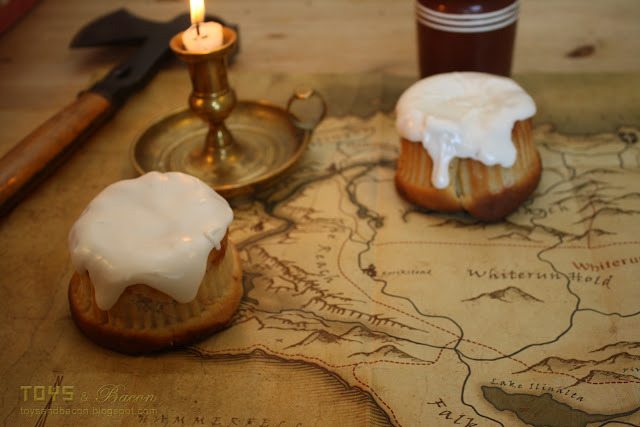 If you didn't play Skyrim, then you have two good things waiting for you: An amazing game and a pretty good recipe for Sweet Rolls. I gave the indication a few weeks ago that I had tried my luck on the Sweet Rolls. I know many other both amateur and semi-professional bakers have tried to replicate the delicious cake from Elder Scrolls V: Skyrim, and as a huge fan of the game (currently lvl 55 Breton destruction mage/DW fighter), I wanted to have a go as well. 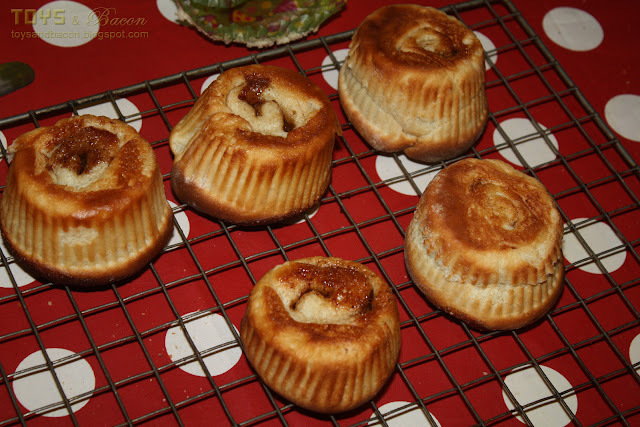 I tried two different methods for making the Sweet Rolls. One that seems to be the preferred way of doing it, by making cup cakes and shaping them into what looks like the in-game cake. 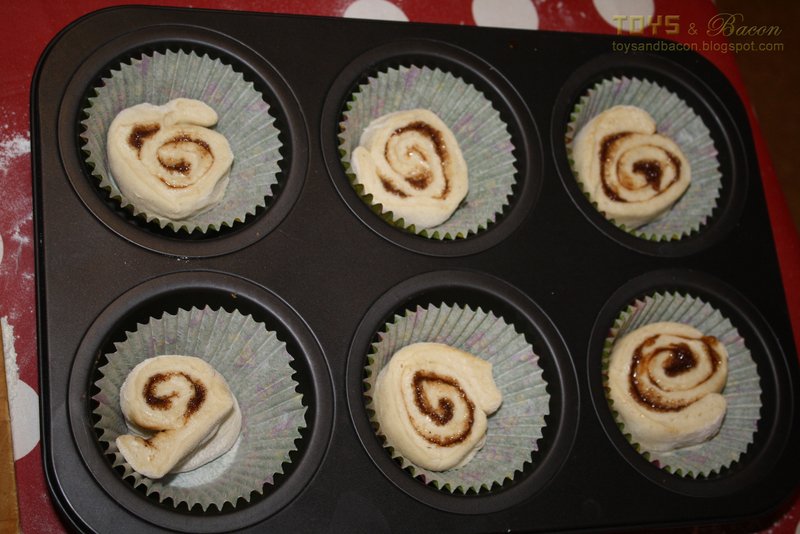 And one that is a slightly modified cinnamon roll. The last one is obviously staying more true to the fantasy game idea of a cake that's rolled. 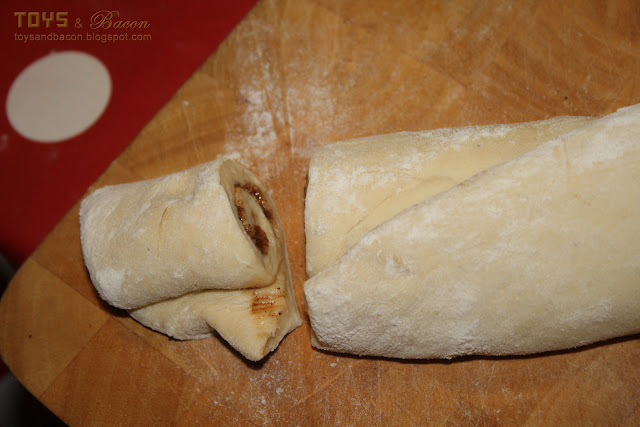 Read on if you are a true Dragonborn and want to make Sweet Rolls! Skyrim was one of those games that made an impact. Not because it was controversial, or doing something entirely new. Not because the graphic was insanely good (it was, but that was mostly accenting the overall experience). Not because the storyline was engulfing (it was, but we've seen games with better story). No. 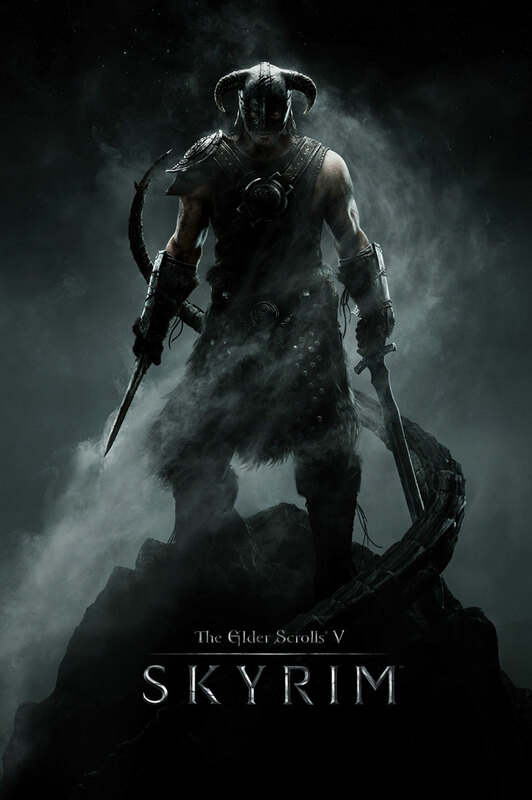 The reason Skyrim was such a monumental game was that it was just damn good. It had it all: interesting main story line and equally interesting side stories, great graphic, fantastic combat system, a huge open world, entertaining non-player characters - and a ridiculous amount of thought put into the details in every aspect of the game. This last point is important here, today, for this very article. 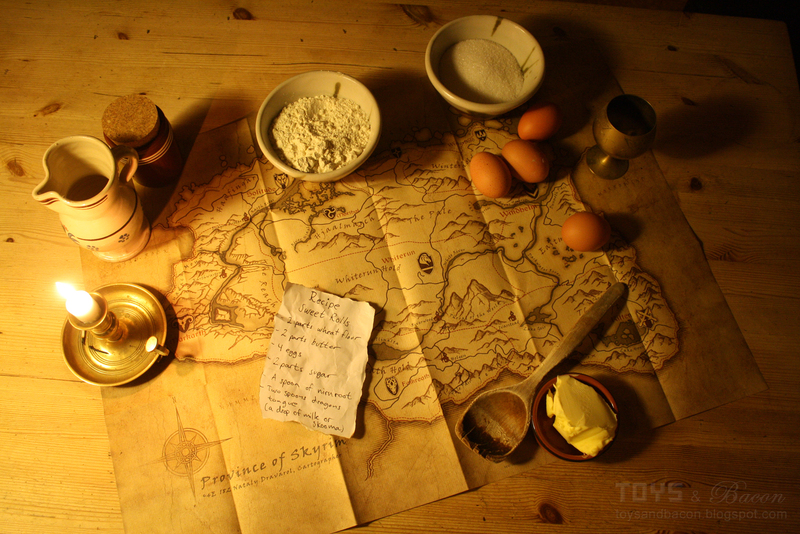 Because when playing Skyrim, I got immediately interested in the various food products and cooking recipes in the game. 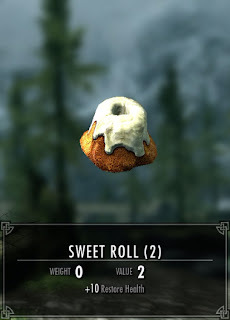 For some reason, the Sweet Roll is one of those details you either instantly recognize and remember, or you simply don't care for that sort of details. I've talked with friends who hadn't noticed the Sweet Roll, even after hundreds of hours in Skyrim, but the amount of attention this snack is getting - I suspect there's also a lot of people like me, who noticed the cake before they had even heard the worn out jokes about flying darts piercing body parts. I've seen people make the Sweet Roll. And I recognize their effort. But there's a recurring problem with the rolls people are making. 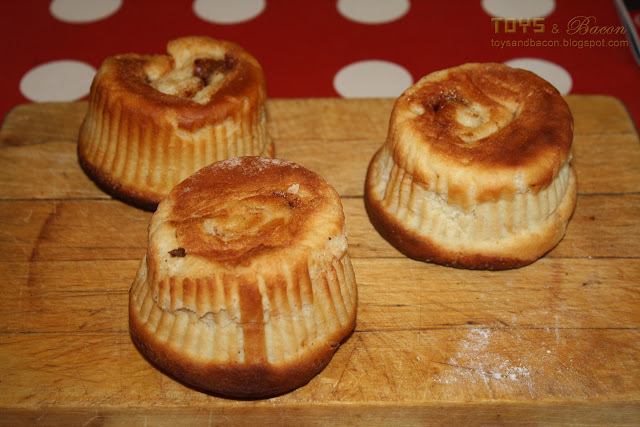 - They are not rolls, but some sort of cup cake. - They are not practical to make. Let me try to be more precise here. First of all, I have seen people do the roll thing too, but for most of the part, it's a cup cake that looks like the Sweet Roll in the game. And that's fair. The cake in the picture doesn't make sense from a practical standpoint - and certainly not if you consider the ingredients and tools available in a medieval fantasy kitchen. But I made myself the goal to make something that was actually rolled, and that I shouldn't have to alter the cakes significantly. I also tried to use ingredients and tools one could assume they had in the Skyrim environment (ingredients like yeast, and tools like cup cake-shaped pans is stretching this a bit far, I know). I did this as an initial try, I knew very well that I had to have a second attempt, with a dough. But this would at least serve as an example of what the Sweet Roll isn't. In fact, one could argue that this is total failure, except for the wicked picture of the ingredients - which I tried to replicate in the Roll Method. This recipe in itself is an excellent cupcake recipe, and with a proper frosting (like the one you will see later), it would look like a close replica of the in-game Sweet Roll. But it wouldn't be a Sweet Roll. And here's some pictures of the process and the uhm.. weird result. When the time came to coat it with frosting, I had stopped caring, and made it too thin - causing it to soak into the cup cake. What I can say is this: It felt unnatural to have to carve out the holes, and it felt weird to eat something called Sweet Rolls that weren't rolled at all. I'll make this as simple as possible. Because it's not complicated. This is basically a standard Cinnamon Roll recipe, and makes for anything between 20-40 rolls, depending how big you make them. 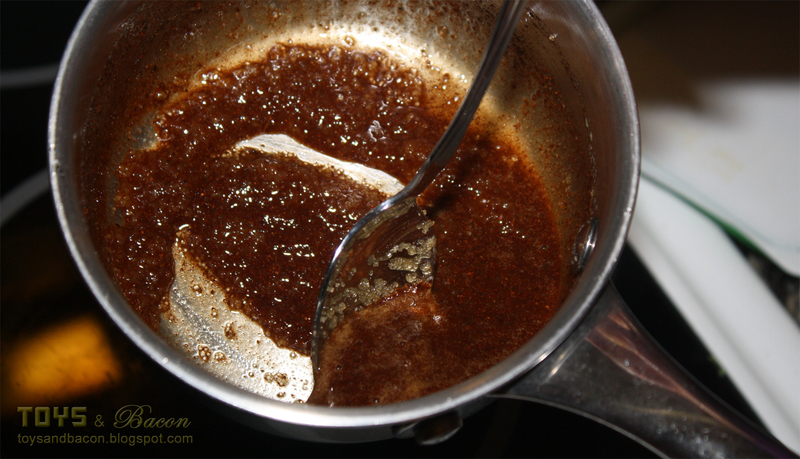 Sugar, butter and cinnamon for the sweet filling. 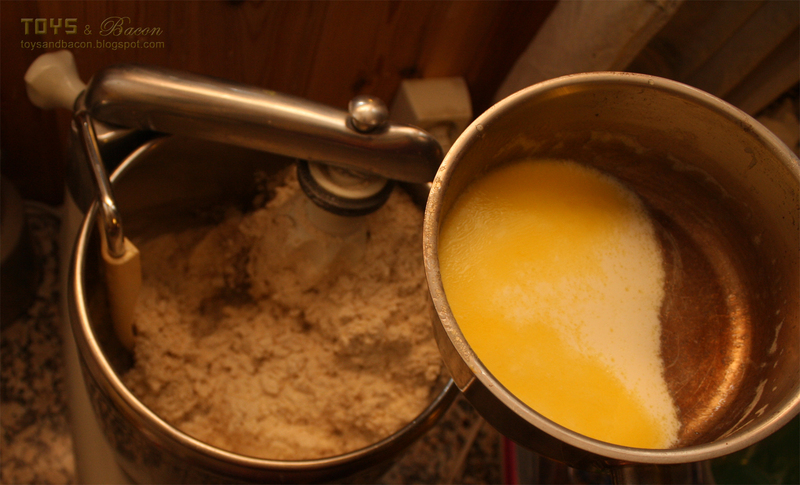 Powdered sugar, eggwhite and a few drops of lemon essence for the frosting. Make a dough, let it leaven. 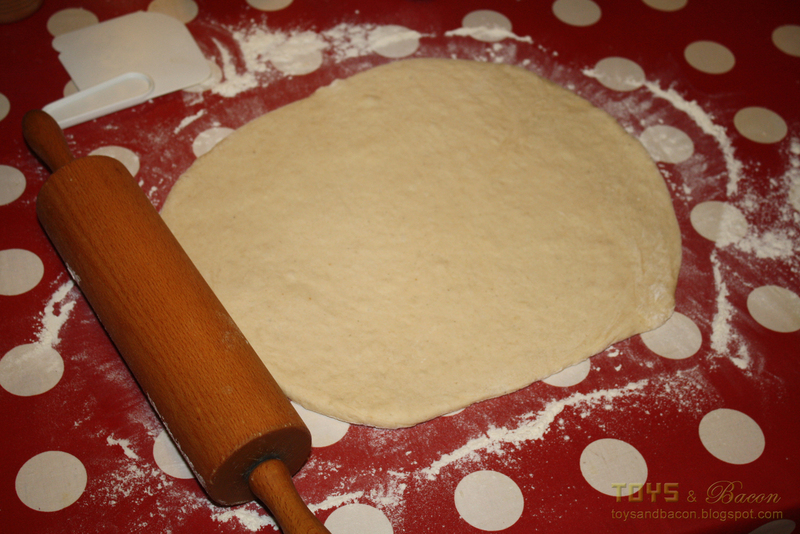 Roll the dough out flat, add filling, make a roll, cut into preferred size, let it leaven some more. Oven at 225 degrees Celsius -(435 Fahrenheit) for 15-20 minutes. Let the rolls cool down, add frosting. 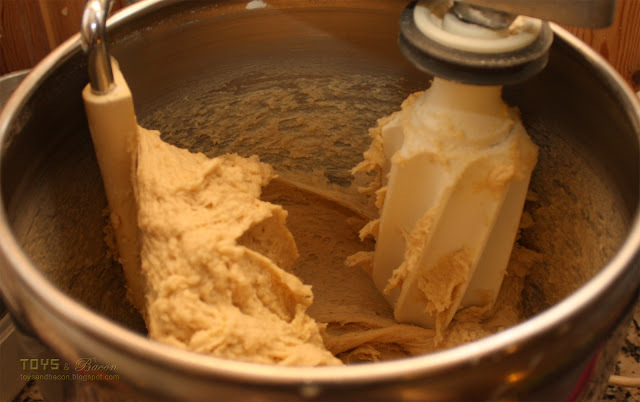 If you want to, you can just melt the butter and throw everything into the mixer. 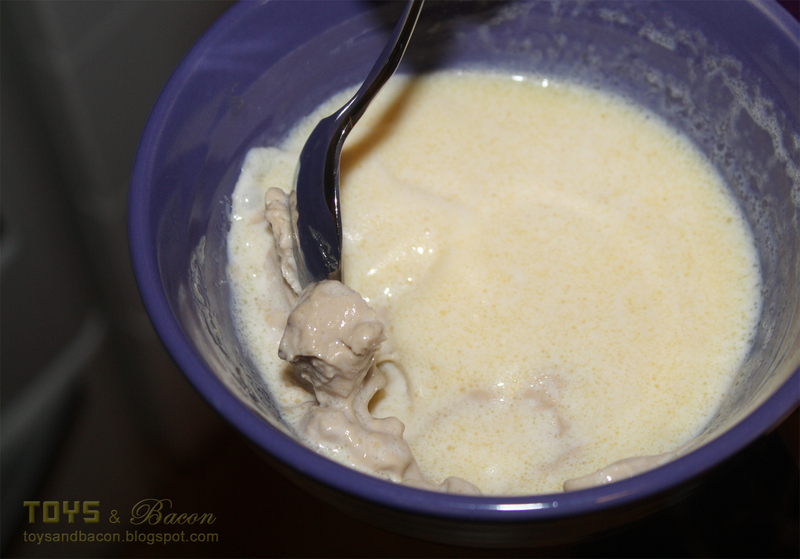 I chose to mix milk and butter first, then melt the yeast in a portion of the hot mixture. Then add everything. 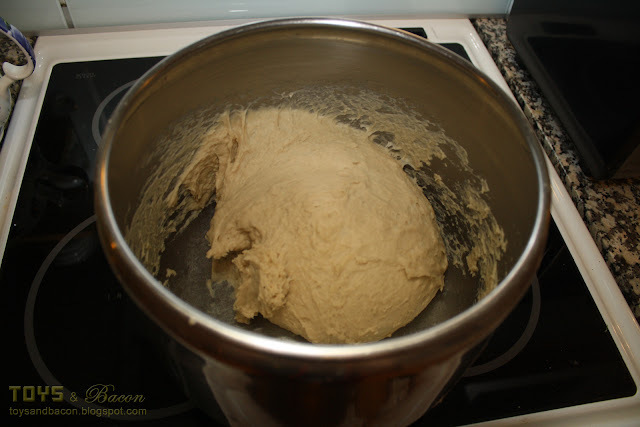 Let the dough sit for a while in a warm environment, expect it to rise to at least double size. Now comes the fun part, making the rolls. 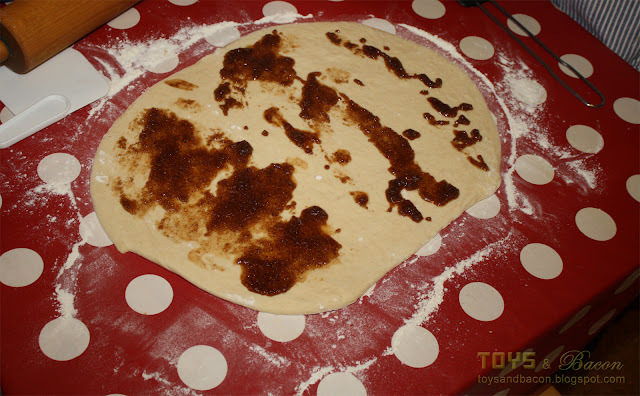 If the dough is sticky, use extra flour. 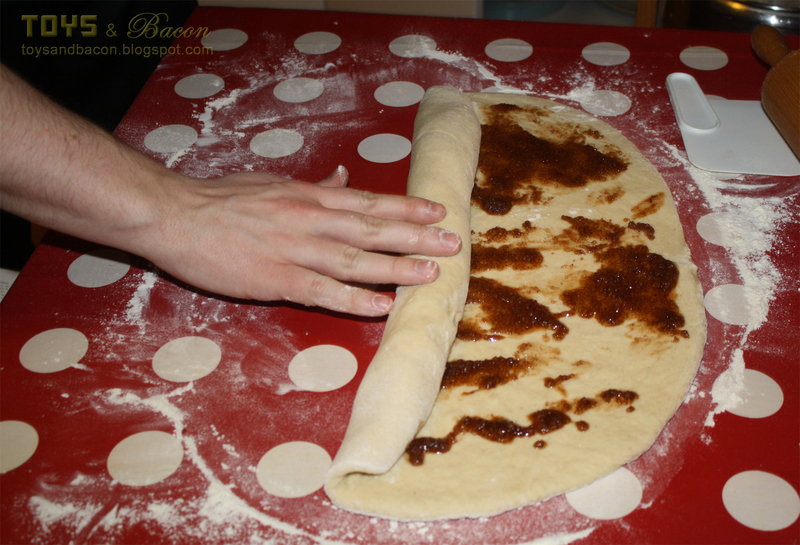 Shape it like a flat piece of dough, add the filling, and roll it up. 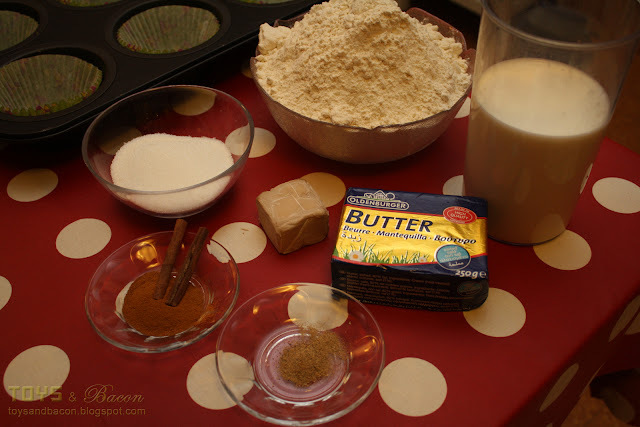 As you can see in the picture, I've melted a mix of sugar, cinnamon and butter to use as filling. You don't really have to melt it first, but it makes it a bit easier to put on the dough. The more filling, the sweeter the Sweet Rolls. Here is the part where you can arrest me. 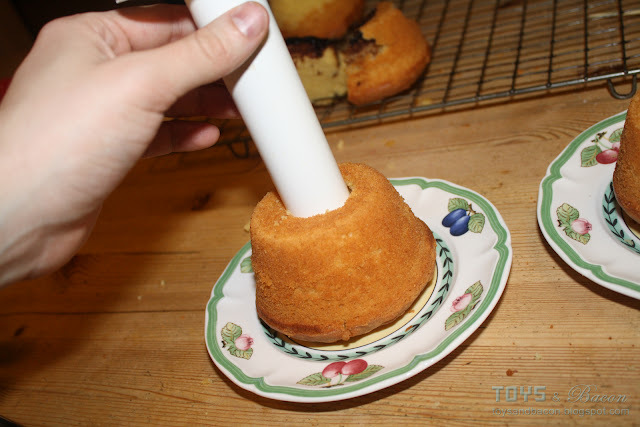 They would be able to make cup-cake molded pans in a medieval fantasy world, but did they have to use this tool to make a sweet roll? I'm not sure. I chose to do so. 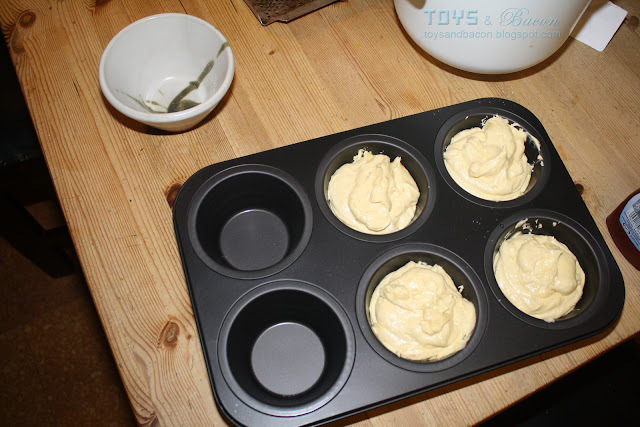 I also chose to add cup-cake inserts, just to avoid washing the pan afterwards. 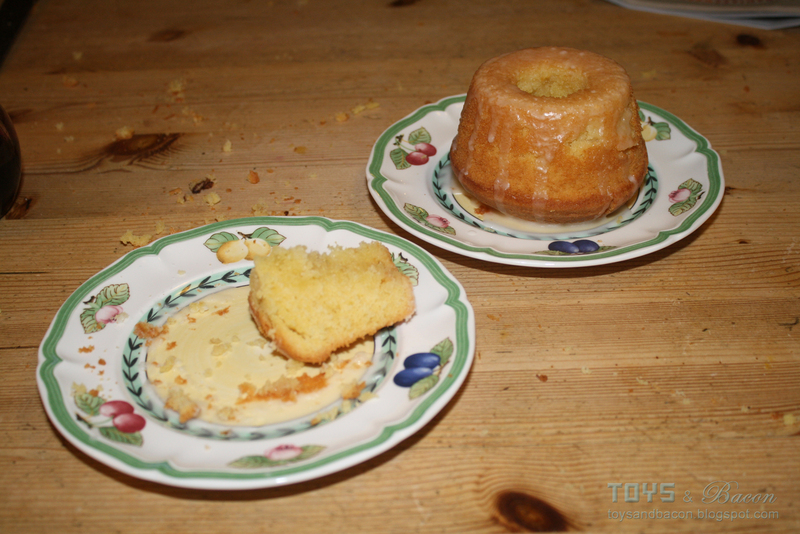 In hindsight, this was a slight mistake, as it left that 21st century look to the cakes. I had an idea that it would cause some texture to the surface, instead of the cakes having a smoother surface. 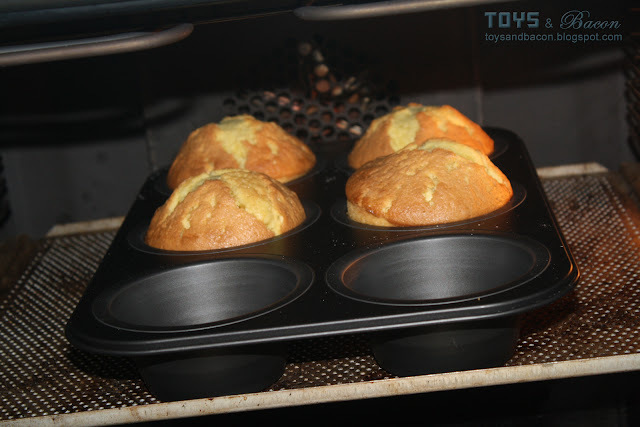 The pieces shouldn't fill the pan molds, as you can expect the dough to rise even more. In the oven for 15 minutes at 225 degrees Celsius. If you use hot air, it will require less time. Notice that these does have holes, as the in-game Sweet Roll, but not as prominent. The hole is closed due to the cake becoming compact. It's a gravity thing I think. This makes me assume that the rolls would be made with the hole up, not down like I have done. But the size of the hole would also depend on how tight I roll the dough. The frosting is is really not my kind of thing, I think it's too sweet. But other people have commented that it was suitable, and complimented the dough, which wasn't that sweet. Anyway, this is definitely not the only way to make something that looks like a Sweet Roll, but it is one way. And as this is both a roll, and fairly natural way of making them (no cutting, no shaping, no cheating required), I'm satisfied with the result. 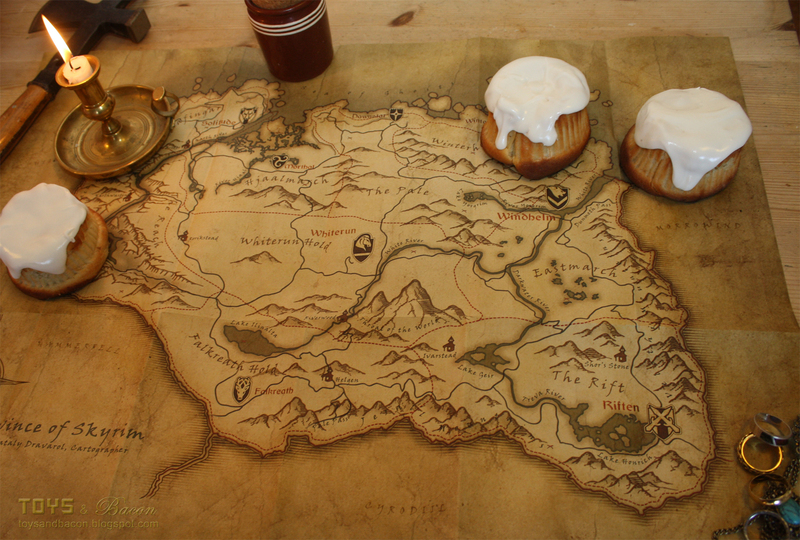 Enjoy your Sweet Rolls, and enjoy your adventures in Skyrim, Dragonborn! How much yeast did you use? Is 2 teaspoons enough? Yes, any amount of yeast will do. I used something like 5 teaspoons. 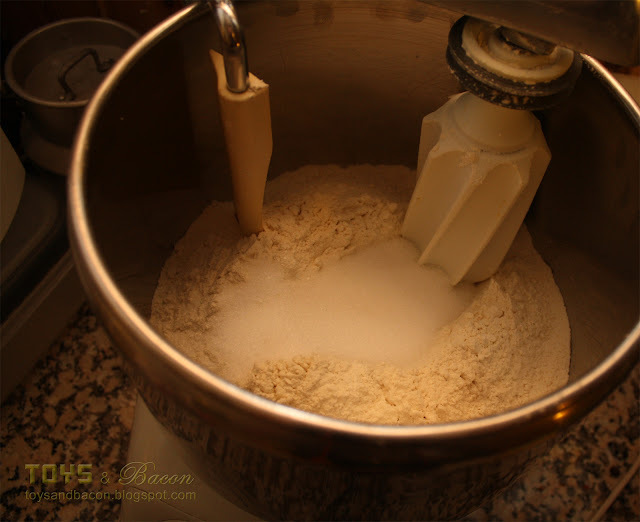 More yeast means quicker leavening process, but in theory it's enough to just not wash the bowl between every time you bake breads. 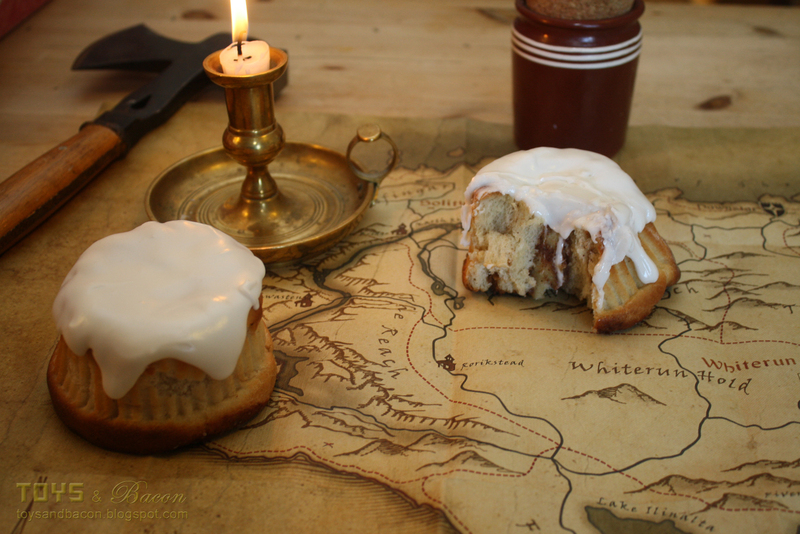 Let me guess, someone stole your sweet roll? anon: dough sits until it's at least twice as big. there's no correct answer for this, as it all depends on the temperature. if it's warmer, it will rise quicker. just don't make it too hot, and you will start the baking process. frosting is powdered sugar and liquid. just be very careful with the liquid, it's easy to use too much leaving you with a lot more frosting than you really needed. 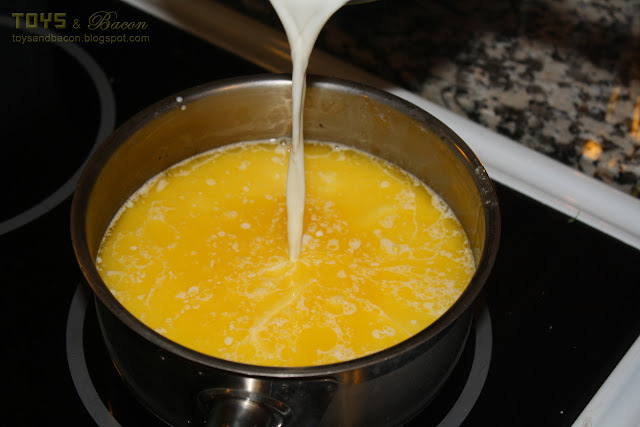 I like to use lemon or orange juice as the liquid, to add some taste. others use egg white to make it harder, crisper. or just use drops of water. Where is the best place to buy cardamom? Joe: Any respectable grocery store should have cardamom. What would these measurements be in the US, instead of Metric? Updated with what I believe is the US measurments. 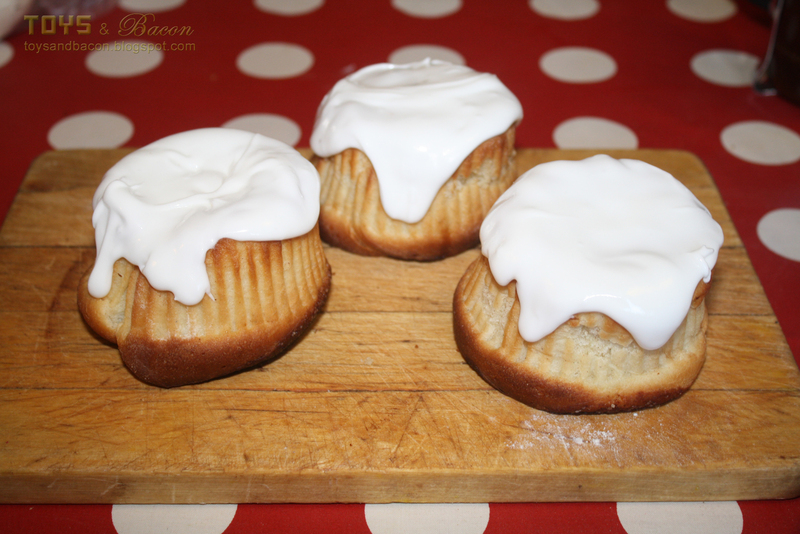 Let me guess, someone baked a sweet roll?